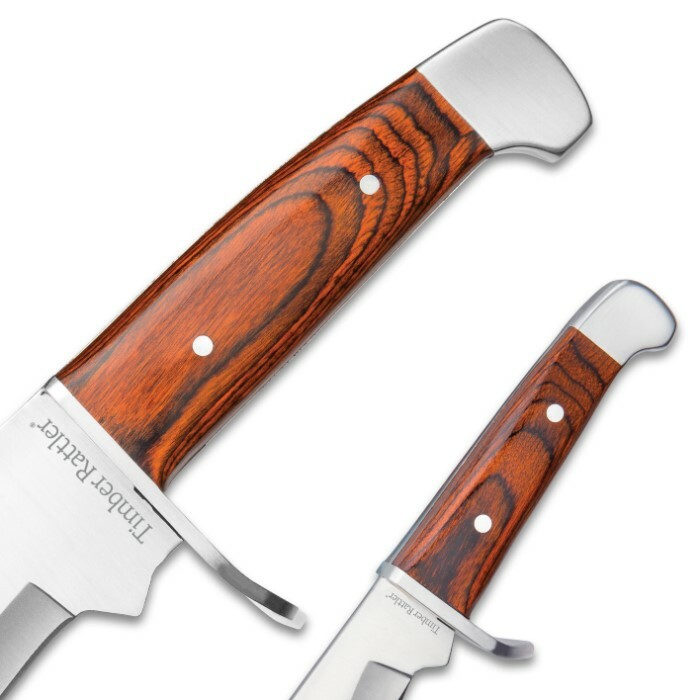 Timber Rattler Warcry Echo 2-Piece Fixed Blade Knife Set - Bushcraft and Bowie Knives - 420 Stainless Steel - Pakkawood - Nylon Belt Sheath - Outdoors, Survival, Collecting & More | BUDK.com - Knives & Swords At The Lowest Prices! Let me hear your warcry! Hear the echo as it reverberates off mountains, yonder? Timber Rattler’s “Warcry Echo” set is an outdoorsman's dream, with two distinct, yet equally capable fixed blade knives tailor made for hunting, camping, fishing, survival and more - the "Warcry," a hulking 15 3/4" bowie, and the "Echo," a handy 8 1/2" bushcraft knife. Both knives are housed in a single heavy duty nylon belt sheath, so they're easy to transport and keep together at all times. The Warcry Echo set offers versatility and range that simply can't be matched by any single knife. Each knife brings its own unique capabilities and strengths to the field, allowing for fine, precision cutting, rigorous hacking and chopping, and everything in between. Both feature resilient, razor sharp 420 stainless steel blades, full tang construction and handsome, richly grained pakkawood handles. The "Echo," i.e. bushcraft knife, is an excellent all-arounder - easy to manipulate yet amply sized to tackle day-to-day chores and then some. Big, bad and bold, the "Warcry" bowie is all muscle - no "fat" or useless filler. Its mammoth clip point blade makes quick work challenging jobs, retaining its razor sharp edge through it all. Both knives feature matching pakkawood handles, which are not only eye-catching and beautiful, they offer a "beautiful" grip and hand-feel, as well! Tough as nails and loaded with complementary features, the Timber Rattler Warcry Echo Set is a prime example of how two edges are always better than one - especially in remote back country environs. Whether displayed in a collection or tested in the field, the Warcry bowie and Echo bushcraft knife always perform at the top of their game. 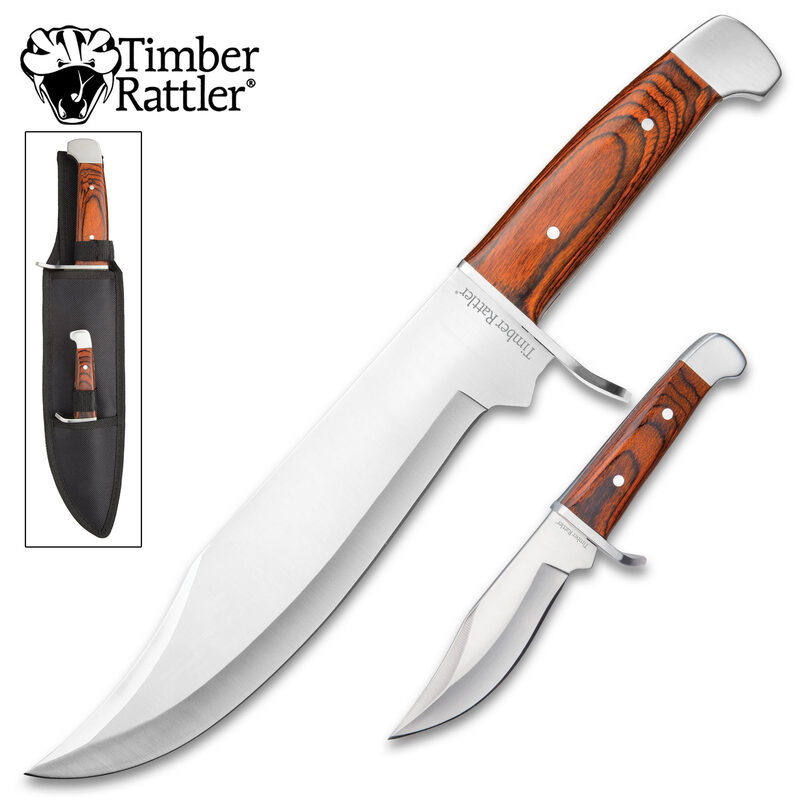 Timber Rattler Coliseum Battle Bowie / Fixed Blade Knife - Stainless Steel - Hardwood Handle, Brass Pins, Brass Guard - Nylon Sheath - Collecting, Field Use, Display and More - 15 1/2"
Got these in yesterday and I'm very impressed. I like the bowie, it feels good in the hand, especially with a glove on. Nice heft to it, should make a great camp knife, very very sharp and seems very well built, I think it will take a beating. I love the small one, the handle is slightly too small for me but still very usable. 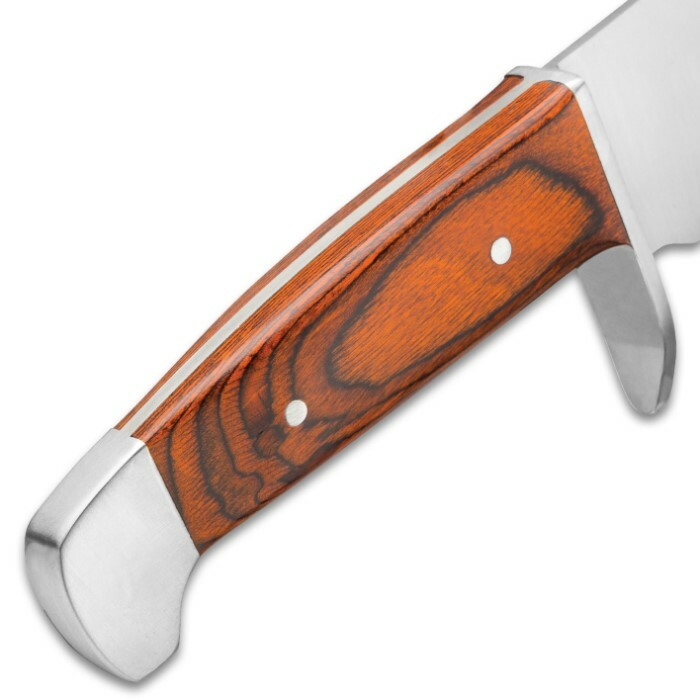 I love the design of the blade, nice belly on it for skinning, perfect size for deer. It alone is worth the price! The sheath isn't bad for nylon, but I make my own anyway no matter what knife a get. My first Timber Rattler and I'm hooked!! Considering another!! 5 stars! !